The Massai (or Maasai) are a tribe in East Africa who are renowned for their naturally long, graceful necks. 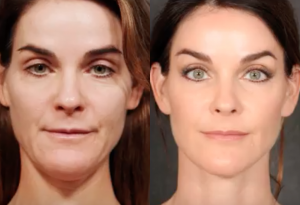 When Dr. Kao observed this, he began to develop a technique that would allow him to achieve the same sculpted appearance in his patients. Thus, Dr. Kao created the “Massai Neck Corset,” which sculpts and tightens each layer of the neck for total and long-lasting results. There are multiple factors that contribute to neck aging. Let’s look at the various layers of the neck. The deep structures, like the submandibular salivary gland below the jaw, becomes larger and droops. The anterior belly of the digastric muscle thickens, and fat deep beneath the platysma muscle, under the chin, enlarges with age. In the middle layer, the platysma muscle, stretches out and becomes loose with aging. The two big plates of the platysma muscle slide forward, creating bands in front of the neck. With hormonal changes and weight gain, fat accumulates underneath the skin of the neck. So, the overall appearance is a thicker, shorter, looser, fat-filled neck. Finally, the skin in the superficial layer loses collagen, elasticity, and wrinkles with sun damage, leading to sagging of the neck. Why Do Traditional Neck Lifts Sometimes Fall Short? Most traditional neck lifts elevate the loose skin from the jawline to the level of the Adam’s apple. This isn’t ideal because most patients have aging skin that sags all the way down to the clavicle. Because of this, the correction doesn’t extend far enough down the neck and will result in disharmony due to laxity near the décolletage and posterior neck triangle. Because the loose skin is not removed from the back of the neck, the patient will appear to have a very clean and crisp jawline and angle of the neck while lying flat on the table. However, after the swelling dissipates in six or eight months, the skin in the posterior neck will relax and slide forward, accumulating as recurrent neck bands in the anterior of the neck. Secondly, most techniques will remove fat from the neck via liposuction. Many times you will see cases of too much fat removal from the under-surface layer. This subcutaneous fat should be carefully preserved to maintain a supple and naturally looking neck. Aggressive liposuction can result in dimpling, tracks, and scar band formation that looks surgerized. Finally, the skin is simply pulled. The deeper structures of the neck such as the submandibular glands, anterior belly of the digastric muscles, subplatysmal fat, and platysma muscles are not addressed. This can lead to unsatisfactory results. Dr. Kao designed the “Massai Neck Corset” to individually sculpt each layer of the neck to ensure total and long-lasting correction. Much like a surgeon sculpts the nose during a rhinoplasty, Dr. Kao shapes the neck. Dr. Kao places all incisions hidden behind the earlobes (when possible, depending on the age of the patient) and in the hairline on the back of your head, so there’s no visible scars in front of the ear. He ensures that the posterior hairline is evenly matched up so women who wear their hair in a ponytail won’t reveal any scarring. Dr. Kao begins by addressing the deep layers. He shaves down prominent submandibular glands, and the anterior belly of the digastric muscle and subplatysmal fat when indicated, in order to create a well-defined jawline. This initiates a good foundation for the rest of your correction. Subplatysmal fat is conservatively removed. The anterior platysma is tightened at the edges to eliminate banding. A posterior corset technique tightens the lateral edge of the muscle to the posterior edge of the fascia at the neck. This step creates a snug fit in order to shape the neck so it looks longer and skinnier. The jawline will appear more defined and more contoured. The fat is elevated off of the muscle along with the skin so that the microcirculation to the skin is minimally disturbed. Dr. Kao thins out the fat in even layers. He does not use liposuction, as the procedure can potentially cause dents in the neck. Conservative fat removal keeps the flap of the skin even but avoids the unnatural look of aggressive liposuction. Finally, the skin is redraped and excess tissue is removed. Dr. Kao smooths the skin and finishes sculpting your new neck appearance. To see how a “Massai Neck Corset” can transform your appearance or for more information about facial rejuvenation, schedule your consultation with Dr. Kao today. You can call our office at (310) 315.9211 or contact us online.